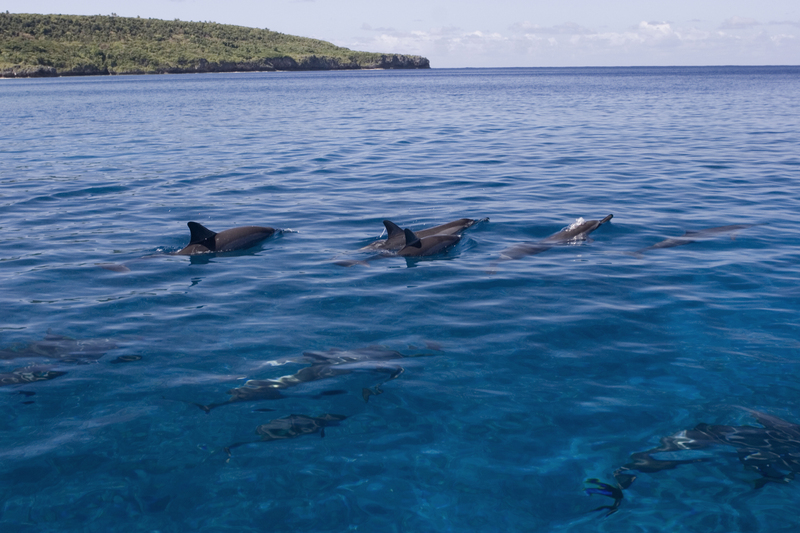 Annie tells me I just missed the humpback whales, which breed and calve around Niue roughly between July and November. Last year, she said, some yachty tried to ride one of the humpback whales. Which really pissed the Niueans off. Riding whales, Annie says, is very bad form. Annie and her husband, Ian, own Niue Dive. They’re good-hearted people but I think they’re probably a little nuts. Trying to run a business on an island like Niue (and raise two little kids at the same time) has got to be challenging. Particularly when you’re dealing with stuff like having no electricity. Or cyclones. I asked Annie if she and Ian thought about moving after Heta hit the island in 2004, destroying a good chunk of the island. I think that sums up the attitude of a lot of the people on the island. Yes, it’s incredibly rustic, but it’s also stunningly beautiful. So your head tells you to go but your heart says stay. You know what Woody Allen says about irrational desires—the heart wants what the heart wants. 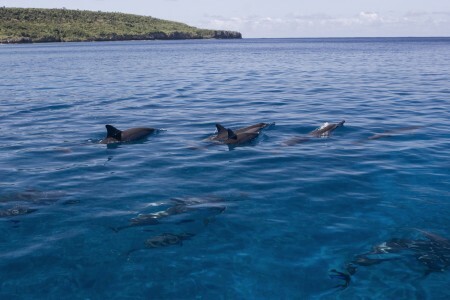 The first day I met Annie and Ian they suggested they take me swimming with one of the pods of spinner dolphins that hang around by the Matavai. When they say “swim with the dolphins” that’s exactly what they mean. You hop into the water with snorkel gear and a diving glove and then hold on to the side of the Zodiac while Annie guns you around the cove. With your free hand, you point out where the dolphins are heading. And you do this while trying not to drown. You’ve got to love her optimism. I wonder if she also thinks the parts for the generator are going to be arriving soon and we’ll get the electricity back? Yesterday I was sitting out on the deck of the Matavai drinking my coffee when Annie popped by to say the spinners were down in the cove and she was taking a couple of the other guests out in an hour or so and did I want to join them. Hell yes. So I got my snorkel gear and met her over at the dive shop. 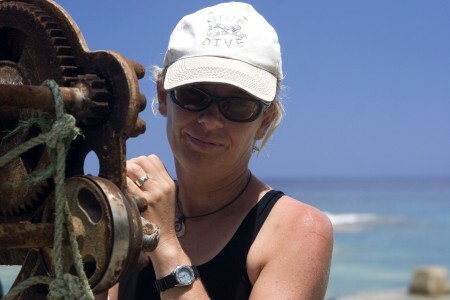 We loaded the Zodiac and drove down to Avatele Beach where there are the sad remains of a small fishing wharf largely destroyed by Heta and a rusty winch, that looks like it’s going to fall apart at any minute, that Annie used to lower the inflatable into the water. Five minutes later we were in the middle of a large pod of spinner dolphins. They rode the wake beside the boat and, just for the hell of it, launched themselves out of the water, leaping five or six feet in the air and doing acrobatic twists and turns that would make a 13-year-old Chinese gymnast proud. I put on my snorkel gear and quietly slipped into the water, not wanting to freak out the dolphins. There were like 20 or 30 of them all around the boat. I grabbed onto the side of the Zodiac and pointed straight ahead with my free hand and we were off—zipping off with the dolphins. Not to get all anthropomorphic here, but it sure seemed to me that the dolphins were getting as much pleasure out of this encounter as I was. They’d intentionally let me get just a few feet away and then zip off, do a flip or two, and then come back to stare me in the face as if to say Wha’ cha think of that, mate? Every so often a dolphin would come and swim with me (instead of the other way around), sidling up right next to me and adjusting his or her speed so that we were in sync. Almost as if inviting me to let go of the boat and grab ahold of him instead. Which, of course, I would never do. Mostly because I know it would piss Annie off. Bad form and all of that, you know.